What follows is a list of all the major sites and features of Varisia that your characters know enough about to be worth mentioning. A map of Varisia showing the locations of these entries and more is available here. Ashwood: While many forests in Varisia bear dark reputations, Ashwood’s is legendary. Everyone within a hundred miles claims to have a relative or friend-of-a-friend who personally encountered a ghost, werewolf, or other spook within the wood’s brooding borders. Yet while locals might boast excitedly and exchange tales by day, at night they bar their doors and pile firewood high, for all too many of the stories are true. Calphiak Mountains: The low, young Calphiak Mountains are not so much avoided as they are ignored; few creatures besides the odd solitary troll live there, and most of Varisia is content to leave it that way. Only sages from Riddleport hunting for artifacts take much interest in the place. Celwynvian: Deep in the Mierani forest, the ancient elven capital of Celwynvian stands empty, its verdant palaces and delicate towers poised breathlessly in the half-light beneath the canopy. Avoided superstitiously by other races during the elves’ long absence, the City of Emerald Rains has been cut off from the rest of Varisia since their return; the elves seek to provide their kind with a refuge from the outside world, and refuse all requests by outsiders to enter their ancestral home. Churlwood: A tangled forest choked by tenacious vines, Churlwood is almost impossible for non-natives to navigate, making it the perfect refuge for the bandit gangs and goblin tribes that raid from its borders. With its plentiful game and renowned ability to confuse even the most canny trackers, the wood is a popular destination for wanted men, its borders a haven for rogues—hence the expression, "Safe as a thief in Churlwood." 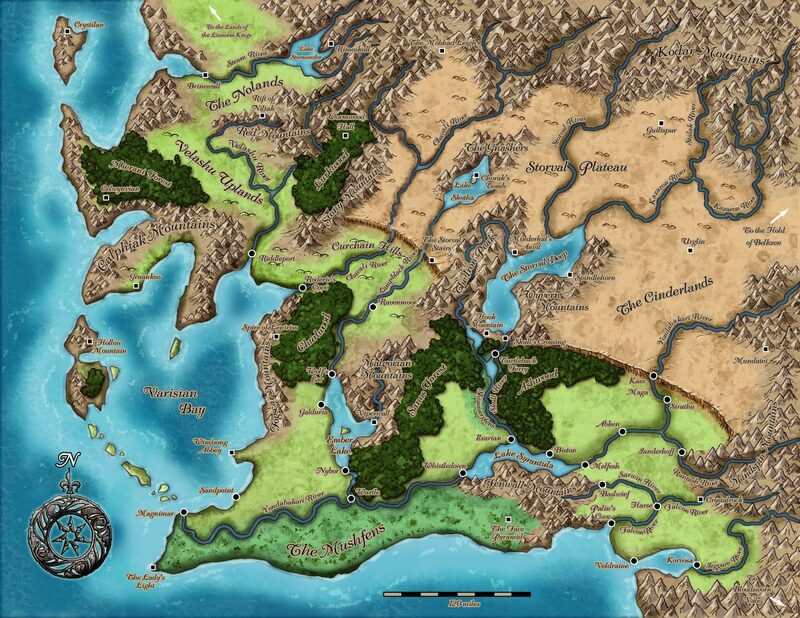 Cinderlands: The Cinderlands take up the majority of the southern Storval Plateau, its dry, ashen soil approaching desert status in many places. Many of the plants here require fire to split open their seedpods, and in the summer, wildfires race across thebadlands in vast sheets of flame ignited by the ferocious seasonal thunderstorms. In these harsh environs, only the Shoanti make any real settlements, and these generally consist of yurts and other easily transportable structures. Crystilan: Visible from the sea, Crystilan is a shining dome of translucent crystal containing an ancient city, perfectly preserved like a fly in amber. Easily the best-known Thassilonian artifact in Varisia, the dome is glorious to behold, catching the sun’s light too brightly to stare upon directly. Curchain Hills: The hollows and grassy dells of the Curchain Hills are home to relatively peaceful tribes of Shoanti, great herds of grazing aurochs, and several superstitious families of frontiersmen that perpetuate the myth that the hills were carved by magic. Ember Lake: Presumably fed by hot springs as well as the Lampblack and Malgorian rivers, the waters of Ember Lake rise up warm from the rolling plains, certain spots along the shore steaming in the colder months. Fenwall Mountains: While few attempt to establish any real homesteads in the monster-infested Fenwall Mountains, the peaks’ rich lodes of iron and precious metals make them an attractive destination for those lower-class and undesirable Korvosans seeking to strike it big as prospectors. Fogscar Mountains: The dense-packed goblins of the Fogscar Mountains squabble among themselves constantly, with each stony gully seeming to host a new tribe of knee-biting scavengers. While narrow roads run between the misty peaks, travelers are advised to keep well away. Hollow Mountain: Upon the largest of Rivenrake Island’s jagged peaks sneers the shattered, monumental visage of a stern looking woman scowling ever south over the remnants of the titanic ancient bridge that connected Rivenrake to Argavist Island. Shorn vertically in two, the face’s broken half reveals levels upon levels of exposed architecture within the mountain, tempting adventurers with the promise of untold discoveries. Ilsurian: Fiercely independant, this fishing village cedes to neither Korvosan nor Magnimarian rule, and all its townsfolk train against the day when they might have to defend their freedom from tyrants. The Iron Peaks: Although the farms in the valleys along their southwestern edge benefit from the mountains’ rain shadow, the Iron Peaks are renowned as the domain of easily irritated ogres, hill giants, and stone giants. Wherever possible, locals avoid venturing beyond the range’s foothills, and advise travelers to do the same. Janderhoff: With its massive iron curtain wall and steeples of beaten copper, the dwarven stronghold of Janderhoff squats like a great armoured beast among the foothills of the Mindspin Mountains. Yet, despite its forbidding appearance, the city is a bustling nexus of trade, with Shoanti and Chelaxians alike passing through the well-guarded tunnels that form the city’s only entrances. Once inside, visitors quickly find themselves in the low-ceilinged markets and smithies that provide the city’s livelihood. Kodar Mountains: Tall and forbidding, the jagged snow-capped peaks of the Kodar Mountains are among the highest in the world. Only the hardiest creatures, such as giants, rocs, and dragons, are able to withstand the extreme climate and treacherous cliffs. Numerous mysteries and legends have origins hidden deep within the Kodar Mountains, such as the quixotic Seven-Spired Palace of Desna, the mystic headwaters of the River Avah, and the lost city of Xin-Shalast. The Lady’s Light: Leaning precariously at the end of a rocky spit, the Lady’s Light is a southern sailor’s first glimpse of Varisia. Nearly two hundred feet high, the enormous stone lighthouse is shaped like a sensuous woman in a flowing dress that leaves one breast bare, her right hand pointing a staff that shines a brilliant beam of light out to sea at regular intervals. At the statue’s base, a gigantic, strangely hinged stone door presumably leads into the lighthouse’s interior, but none are known to have unlocked it in modern times. Lake Stormunder: Lake Stormunder takes its name from the extensive underwater geysers that boil and churn in its depths. On its shores, fishermen are sometimes forced to take shelter as rocs skim low over the surface looking for prey. Lake Syrantula: One of the most frequently traveled waterways in Varisia, this hundred-mile-long lake is a primary part of the trade route between Korvosan and Magnimarian holdings. Malgorian Mountains: While adventurous herdsmen make this one of the most civilized mountain ranges in Varisia, it’s also one of the most geologically active. Although it contains few volcanoes of any real size, geysers, hot springs, and bubbling tar pits dot the range, filling the mountains with strange and sometimes choking clouds and making travel treacherous for those unused to such hazards. Mierani Forest: The regional home of the elves since time immemorial, the Mierani Forest is a place of enormous, spreading trees and abundant wildlife. The Mierani elves maintain the forest as a civilized wilderness, allowing the course of nature to run unimpeded and protecting it from monstrous threats and axe-wielding interlopers. Mindspin Mountains: Filled with giants, ogres, and trolls, not to mention deep crevasses and dangerous rockslides, the Mindspin Mountains are considered a deathtrap for all but the most experienced travelers. The Mushfens: South of the Yondabakari, the land becomes a sweating tangle of boggy marshes and impenetrable mangroves, endless meres and fens capable of swallowing men without a trace. Along with the usual dangers of the swamp, the Mushfens are known for their vicious populations of boggards, marsh giants, and worse. Red Mountains: The Red Mountains are relatively low by Varisian standards, their rocky soil rusted red with thick iron deposits that the few residents struggle to mine. Riddleport: Varisia’s northernmost port, the infamous city of Riddleport is renowned as a haven for scoundrels, outcasts, and worse. Cutthroats fill its harbor and dockside brothels, with Riddleport’s officers of the law being just another gang of thieves (and hardly the most powerful one at that). Yet even in such a den of inequity and vice, scholars and historians abound, attempting to decipher the runes of the great arch known as the Cyphergate, which spans the mouth of the harbor and looms over each vessel that passes into the city. Roderic’s Cove: Besieged by the goblins and bandits of Churlwood on one side and pirates on the other, the port-town of Roderic’s Cove submitted to Riddleport 10 years ago. To everyone’s surprise, both in the town and throughout Varisia, the pirates spared the community, employing it as a shipping and trading port for merchants without the stomach to enter Riddleport. Sanos Forest: While Whistledown is regarded by other races as the primary gnome settlement in Varisia, Sanos Forest is their true domain. Although gnomes as a race are extremely tight-lipped about what goes on in the forest, there are legends that somewhere deep in its heart they maintain a gateway to the First World of the fey. The Storval Deep: Filling the entire valley between the Iron Peaks and the Wyvern Mountains, the Storval Deep is a massive lake held back by an immense dam, Skull’s Crossing, at its southern tip. Storval Plateau: The land of Varisia is split in half by the Storval Rise, a thousand-foot-tall cliff sculpted for much of its length into ancient weatherworn statues, cliff fortresses, and strange portals into eldritch depths. The Rise separates the lush, fertile lowlands from the harsh, arid lands of the eastern plateau. Here, giants and tribes of hard-edged Shoanti hold sway, scratching an existence from the plateau hardpan or chasing herds of thundering aurochs across the sparse grasslands. The Storval Stairs: Although sized for a colossus, the Storval Stairs are still the most expedient route from Varisia’s western lowlands onto the plateau. Here, where the Storval Rise shrinks to only a few hundred feet of vertical cliff face, great stairs have been cut from the cliff, flanked on either side by enormous statues. In the thousands of years since the stairs’ sculpting, lesser engineers have cut more convenient, human-sized steps and ramps into their sides, routes capable of handling entire platoons of explorers and adventurers. The Sunken Queen: Slowly sinking into the waters of the swamp, this enormous stone pyramid is still imposing, with one entire side carved in a bas-relief of a beautiful naked woman. From the pyramid’s peak extend numerous curving towers at strange angles, like growths or chimneys, and legends hold that within the Sunken Queen’s austere walls lie layer upon layer of deadly catacombs filled with secrets. Turtleback Ferry: Turtleback Ferry is a small township in the shadow of Skull's Crossing, named for its three distinctive barges crafted from the shells of giant turtles. Velashu Uplands: The horse lords of the Velashu Uplands are widely regarded as the best horse breeders in Varisia. Astride their great destriers, the Velashans race across their domain, thanklessly protecting the southern lands and occasionally venturing to Riddleport or beyond to charge top price for their magnificent steeds. Viperwall: Embossed with great stone serpents, the conical roofs of this brooding castle’s many towers shine in the moonlight. Avoided by locals, the structure is often surrounded by a greenish haze of poisonous gas which leaks steadily from fanged sculptures in its walls. Whistledown: Named for the distinctive wooden charms that hang from house eaves to turn the evening wind off the lake into haunting melodies, Whistledown lies at the western tip of the Fenwall Mountains, where Lake Syrantula becomes the Yondabakari once more. Although the town is home to almost as many humans as gnomes, Whistledown is generally regarded as the primary gnome settlement in Varisia, and most of the quaint white-walled cottages are sized accordingly. Windsong Abbey: Established by pacifist, scholarly monks as a forum for interfaith discussion, the vast sandstone edifice of Windsong Abbey emerges from the seaside cliffs in sweeping arches and towers, stained glass windows catching the light and tunnels in its walls and foundation channeling the wind into music like that of a pipe organ. Wyvern Mountains: This range’s name says it all, and travelers here are advised to keep a sharp eye out for roving packs of the poisonous draconic predators that subsist on the mountains’ wild goats and free-roaming llamas. The city of Magnimar is slowly bringing nearby settlements under its governance, setting itself up to become the capital of a fledgling nation. Galduria: While the town of Galduria survives primarily by ferrying grain and lumber along the Lampblack River and Ember Lake, its true claim to fame is its college. By far the oldest structure in town, the Twilight Academy is one of the premier schools of magic in Varisia, rivaled only by the Stone of the Seers in Magnimar and the notorious Acadamae of Korvosa, both of which consider it an upstart devoid of their own rich heritages. Magnimar: Founded by former Korvosans seeking to throw off Chelish rule and form a democratic metropolis, the renowned City of Monuments lies at the southern tip of the Varisian Gulf, built up around one of the last surviving remnants of the enormous bridge that purportedly once stretched all the way to Hollow Mountain. Nybor: Renowned for its racial tolerance, this peaceful farming community has a greater number of half-breeds per capita than anywhere else in Varisia. While it occasionally draws the ire of puritan sects, many are the young Magnimarian noblewomen who are quietly bundled up and shipped off to Nybor when an illicit fling results in pregnancy. Sandpoint: Sandpoint is a sleepy fishing town known primarily for its excellent theatre and exquisite glassblowing, and the only settlement of note on the Lost Coast. Sandpoint has its own entry here. Wartle: A ramshackle trading post full of swampers and fur traders, Wartle perches on stilts above the muck of the Mushfens. As the Mushfens are rich in magical reagents to those who know what to look for, wizards from Magnimar and Galduria are maintain a presence here, training ordinary men and women to recover herbs from the swamp. While the arcanists pay extraordinarily well, the many monsters of the Mushfens make this one of the most dangerous professions in Varisia. Wolf’s Ear: Supposedly, Wolf's Ear was once the lycanthrope version of a leper colony, where werewolves and other such persecuted humanoids could live together in relative safety and comfort. While this rumour is accepted without question by most locals and has served to make the town disproportionately well-known, there is little evidence suggesting it. Last edited by LeadPal; 3rd of June, 2008 at 06:48.